If you have the best grow tent in your arsenal, your job will be that much easier. Grow tents are a perfect way to conveniently add an isolated environment to any room in your home. It’s also a lot more affordable that outfitting an entire room for growing and 10x safer than growing outdoors. 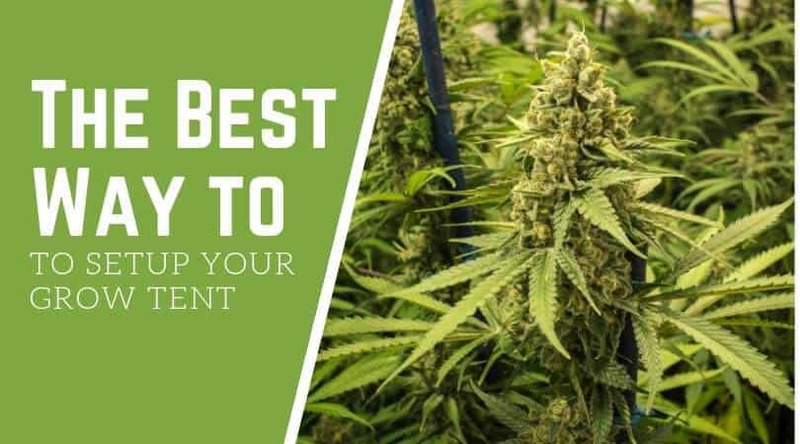 Today, I’ll show you how to choose a cannabis grow tent, all about setting it up and, of course, review best ones on the market. What Should Come in a Pre-Built Package? How Many Plants in a 3x3 Grow Tent? How to Keep Grow Tent Cool? Grow tents are a great option for modern day growers. Not only do they allow you to create an ideal environment for growing cannabis, but they're also easier to set up and much more user-friendly than a traditional garden. Now while apartment dwellers can just line their closet with foil, throw up some lights and grow herb, it’s not going to produce the best buds possible. 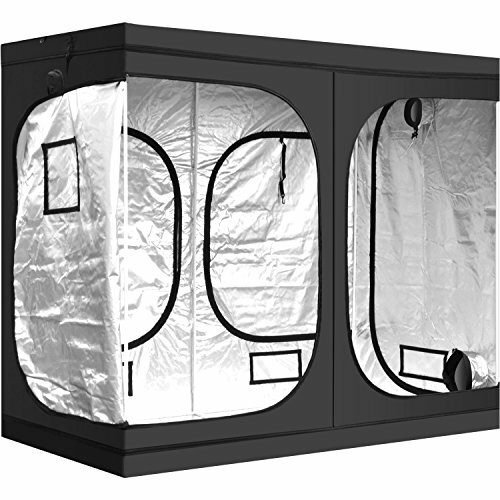 Grow tents allow you to completely control the humidity, temperature and light—all of which are vital to growing marijuana. Even if you don’t live in an apartment, growing weed outdoors is risky. A lot of us may live in a legal state now, but that’s not going to stop someone from jumping your fence to steal your hard work. It also allows for maneuverability. If you move, you can load up your tent and move shop. You do not have to invest in a full scale grow room to get the benefits of one. There’s not really much to them. Reading through these grow tent reviews will teach you damn near everything you need to know. You’re going to want purchase a size that will work with the amount of area you have, while also taking account how many cannabis plants you want to grow. Measured in feet or inches, you can get the best grow tents in various sizes from 2’x2’x4’ to massive tents that are 8’x6’x7’. To control the environment perfectly, the best grow tents are completely light-proof. This is also a discretion concern. If you’re trying to grow without anyone knowing (which you should always be doing) then you don’t want light to be shining through your tent. And you do not want light sneaking in to mess up your plants flowering stage. This is usually shown as a percentage, and it’s used to demonstrate how reflective the inside of the tent is. You want high reflection so that light can reach even your bottom buds. Plus, it helps conserve energy and requires you to use less light to achieve more results. The old school way has always been foil or white paper, but the best grow tents use materials like Mylar. True, you can get ventilation with a regular fan or even opening up the tent, but that’s not what we're going for. We want to create an optimal environment. To do this, you need one with plenty of ways to set up your exhaust fans. They offer frames in many different forms. The best, however, are going to be made from metal poles. You need a frame that will stand up to the weights of all your lights and ventilation system. And metal poles will do just that. If you get one with a janky zipper, it’s going to be hard to maintain the environment. You’ll have light leaks, air leaks and not to mention smell leaks. Zippers are something you want to make sure the manufacturer isn’t being cheap about. To put it simply: everything you need to grow. Some kits even go so far as to give you pots, soil and nutrients. And, some hydroponic specific kits give you everything for the hydro set up too. The larger the kit, the larger the price tag, though. Also, you don’t need to buy a kit—everything you need can be bought piece by piece. If you go this route you have a little bit more control over what goes in the tent and you don’t have to cough up a large lump sum to get started. You can buy the essentials and then slowly add to the tent and upgrade your equipment. You'll want to bookmark this page and use this brief overview on setting up your grow. Keep in mind, grow tent setup starts before you even buy your tent. You need to plan where you’re going to place the tent in your home, and make sure that you have plenty of room to run ducting. This means you can’t cram a tent in an area that’s just big enough to hold it. Once you have the tent put together, you can now move on to the fun stuff. You’re going to want a LED grow light that can provide enough light for the square footage of your indoor grow tent. Ideally, your grow tents hanging bars will be adjustable. This is because you want the lights to only be about 6-12” away from your cannabis at any given time. If they are too far away from your cannabis plants, they will stretch out to far trying too reach for the light source. Check to make sure the plug is properly grounded and the correct voltage. Decide on the cord ports you will use. Hang the light on the crossbar and adjust it to the correct height. Set your timer up with the correct “on” and “off” times (24 hr light for veg 12/12 for flower) and plug the timer into the socket. Pull the lamp cord through the grow tent port and plug the LED grow light into the timer. You need to be providing fresh air to your cannabis plants if you want them to grow up healthy. You need to provide proper filtration to make sure you’re giving them clean air AND killing the odor. Your tents air should be replaced at least every 5 minutes that the lights are on. Not only to bring in the fresh air but also to replenish CO2. The equation can get a little complicated when it comes to ventilation. Because CFM can be affected by so many variables like the lengths of the duct and even its path. CFM - This refers to the amount of cubic feet per minute your fan can move. So, to replace the air every five minutes you need your CFM needs to equal the volume of your grow tent divided by 5. If your indoor grow tent is 4x4x4 it has a volume of 64 feet. Divide 64 by 5, and you get 12.8—anything less than this and your will be doing your garden a huge disservice. Keep in mind, this is the bare minimum, and many growers opt for every 3 minutes all the way to 3-5 times PER minute. This can be done in a number of different ways. 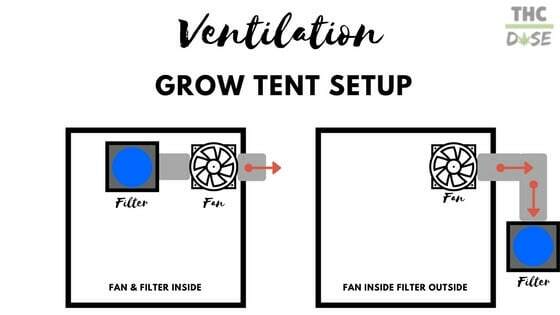 If one of your top priorities is dealing with the smell of your garden, then running both the filter and fan inside the tent will work best. But if you want more room inside the tent, or your grow tent doesn’t have the structures in place to run them inside, you can run them both on the outside of your tent with just duct running out of your tent. Again, it’s all just what works best for YOU. Ideally, you want to give each plant about 4 sq ft. This, however, is not always feasible. Especially when you’re growing in a indoor grow tent that is only 3'x3'. If you did, you’d only be able to grow two plants. 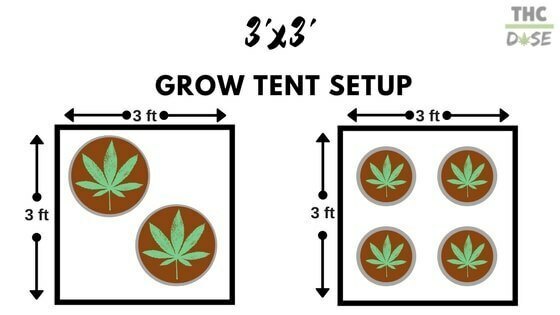 But growing in a tent, you’re able to get away with a little less space per plant. In a 3x3 indoor grow tent you can grow at max 4 plants in rows of two. Putting four in the tent will hinder their size, though. So, ultimately, it will depend on if you'd rather grow two large plants or four medium-size plants. We recommend testing both these methods and seeing which one yields more cannabis. You do not want to get caught not knowing the law, and, even though growing cannabis is legal in quite a few states, there is still strict regulations surrounding it. And another thing, even though you can legally obtain cannabis in 28 states, there is only a few you can grow in. So, please, don’t just assume that if you can carry or smoke marijuana that you can legally grow it. Washington D.C - Every medical marijuana patient is entitled to grow up to 15 plants each. California - You can possess no more than six plants regardless of their stage in the growing process. Colorado - Up to six plants are allowed per Colorado resident over age 21, with as many as three plants flowering at one time. Alaska - Six plants growing at a time with no more than half flowering at the same time. Oregon - It doesn't matter what stage they are you’re allowed four plants per home, total. Sadly, if you’re not in one of these states, you can’t legally grow your own cannabis! Since your grow tent in an enclosed area, you might have a problem keeping it cool. And if you have any experience indoor growing in a tent, you know it can be a challenge to keep it cool. Run your LED grow light at night - Since the temperature in your grow tent is going to be influenced by the temperature outside the tent, run your lamps (which permeate heat) at night when it’s cooler outside. Turn half your lights off - If you’re experiencing a temporary heat wave, you can use this method to simulate an overcast day in your grow tent—a much better alternative to scorching your plants. 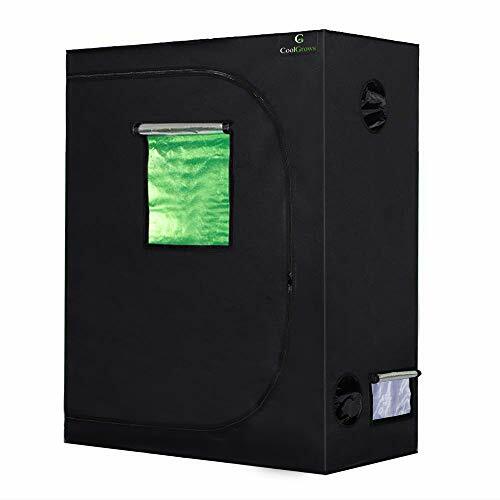 Try adding A/C - There are plenty of portable A/C units that can fit in your grow tent. If you live in the south or other hot areas, during the summer this may be your only option. Remember, you can’t cool hot air with more hot air. Point a fan on your light - This can help keep the light cooler, which is the primary source of heat. Another way to keep your grow tent cool is bringing the air in through ice. Sounds messy, I know, but It’s a quick fix that is easy to set up. What Are the Benefits of Grow Tent? Grow tents are undoubtedly more expensive than building something yourself. So why are they so popular, and why do the professionals use them? 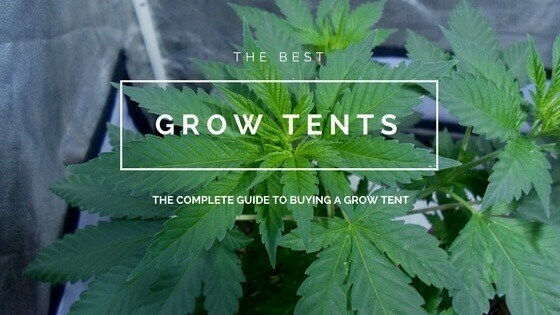 Grow tents make growing weed simple and easy. You don’t need to think about most of the dimensions, components, and tools you need to build something yourself. If you are a beginner grower, this is especially valuable because you won’t waste time building a grow room that isn’t ideally set up for big and bountiful harvests. Grow tents are all designed by professional cultivators, which means you avoid making many of the rookie mistakes by merely growing using tools already tested. Cannabis also likes a particular growing environment, which can be hard to create on your own. They keep the heat, humidity, light, and more trapped inside so you don’t have to work hard sealing around a closet door. It reduces the amount of energy you use as well. Consider how much it would cost to create that same perfect hot and humid environment within a big room, basement, or shed? With a grow tent, it keeps everything sealed inside, so you don’t have to waste energy and your hard earned cash. Floor to ceiling reflection, for optimal light exposure. Sealed walls, to hold heat and humidity. Proper lighting, to ensure big harvests with no burn. Total control with thermostats, timers, and monitors. Maybe you want all the benefits of a to grow tent, but without the initial upfront investment. It's true, grow tents are going to be more expensive than building something yourself. Grow tents are pre-assembled, plus you are paying for the expert-design. Building one yourself requires a few handyman skills, but it can be done. Basic structure: PVC piping or metal shelving unit are a few popular examples. Exterior tent material: Reflective is best, but white plastic poly also works well. Tape or sealant: Gorilla tape or duct tape is perfect for totally sealing the seams. Build out the frame using PVC piping. If you are using this method, you get complete control over the final size and shape. You will need to put a small shelf or table on the inside of the hold your plants, however. If you are using a store-bought shelving unit, follow the instructions to build it. If you have reflective material, begin wrapping your structure with the reflective side facing inwards. If you are using poly plastic wrap, make sure the white side is facing inward. Create a tight wrap by cutting the material to fit, with the sides overlapping and taped shut with gorilla tape. It should be just like wrapping a gift. You’ll want to cover the floor of the unit as well. Leave a space for a door, and cut a piece of material that overlaps on all sides. Put velcro around three of the four sides, and tape the other. Now you have a functioning door! You’ll want to do a little additional research to find safe and suitable lighting for the space you’ve built. LEDs are best because they require little heat management and ventilation. You’ll also want to determine how high to place the lighting above the shelf. Usually, indoor growers choose hydroponic systems to save space and grow more effectively, but with a little research, you can also use soil. Choose small, suitable indoor plants which take well to pruning as you’ll likely have to train it during the vegetative stage. When deciding the top grow tent, we took a lot of factors into consideration. Including quality, specs and price. While the Apollo Mylar Hydroponic Grow Tent might not be the best in every category, it’s solid in them all. Plus, with Apollo, you're getting a brand name that it known in the growing space for quality products including lights, charcoal filters and inline fans. As far as grow tents goes, you couldn’t ask for a better starter grow tent then this. It has a durable metal frame and thick fabric that’s double stitched to prevent any light leaks or climate leaks. 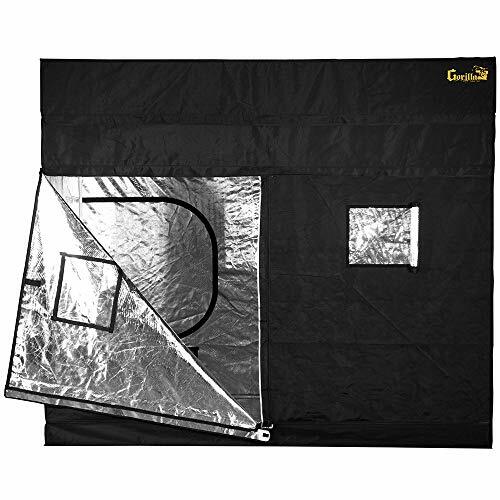 The Apollo Grow Tent is lined with a highly reflective mylar film that is also 100% light proof and tear-proof. They guarantee 92-97% reflection from your grow lights which saves energy while also getting light to the backside of your buds. The kit also includes a removable floor tray—which are great for hydroponics—and a couple of filter straps. The zippers are thick and heavy-duty, but not as airtight as you’d hope. If you look closely, you might see some light leaking through them. Although not enough to spot the tent in a dark room. One of the best aspects of this tent is how customizable it is. With a bunch of six-inch ports, a few two-inch ports and three screened Velcro sealable openings you can hook up any number of fans, filters and lights. And the frame is sturdy enough to handle a couple of lights and a couple of fans—maybe even more. 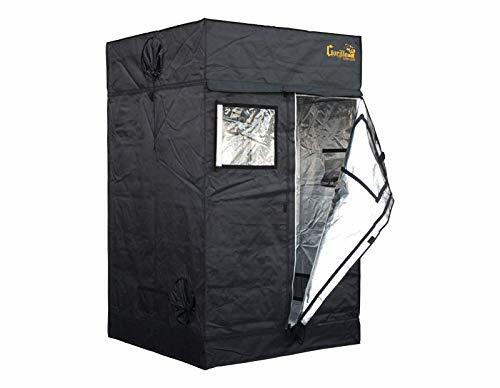 Overall, this tent is a great deal for anyone looking to delve into the world of grow tents, and as far as 4x4 tents go, this is the best. It is big enough to be used as an excellent hydroponic grow tent too. Gorilla Grow Tents—the leading brand in the industry. They make their money by providing high-quality grow tents. The only reason this grow tent didn't make the top of the list was the price. As far as materials, features and overall quality this thing is the best grow tent there is. This grow tent was also made with the cannabis grower in mind with features like an infrared blocking roof insertion 😉 that works to keep the surface temperature cool making it easier to maintain temps. It also comes with a free 12” height extension kit! Which allows this tent to be either 7’, 8’, 9’ or 10’ tall. So, if you want to grow bigger plants you no longer have to buy a new grow tent. Its frame is 100% interlocking metal that can hold up to a whopping 300lbs! 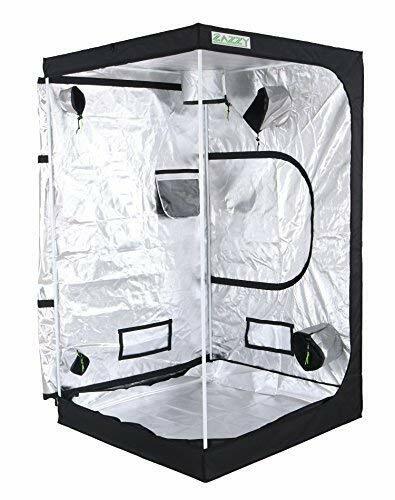 This tent is loaded with features like an EZ view observation window to see your plants without disturbing the environment and a large layout to be able to move around freely in the tent. Its made from a thick material and dense threading to help combat smell and noise from leaking out. Not to mention a flood pool, diamond reflection technology, double cinching ducting ports, a tool pouch and bug resistant pre-filters. The biggest downside to the grow tent in the price. If you’re just looking for a good grow tent to grow cannabis with, you can get that done at a much cheaper price point. While a tent like this might last a few more grows then the others, it’ll ultimately be up to you to decide if you want to invest in a longer-lasting, higher quality tent or spend that money on better lights and fans. iPower is another leader in the growing industry making all kinds of gear that makes a grower's life easier. This grow tent is no exception. The mylar lining interior reflects 95% of light and thanks to its steel frame it’s sturdy as all get out. You can hang any number of lights and fans from its support beams. Heck, they claim you can hang up to 110lbs from them, though that’s a whole lot of lights. It comes with a water resistant spill tray which makes watering your cannabis nothing to sweat. And it comes with multiple fully adjustable vent doors. Plus, double duct doors that block out the light while allowing you full customization over your exhaust system. The zippers are the biggest downside to this grow tent. There are a lot of zippers on this beast, and some do not do a great job containing a bright LED grow light. And they have to be reset fairly frequently, which is nothing but a pain. 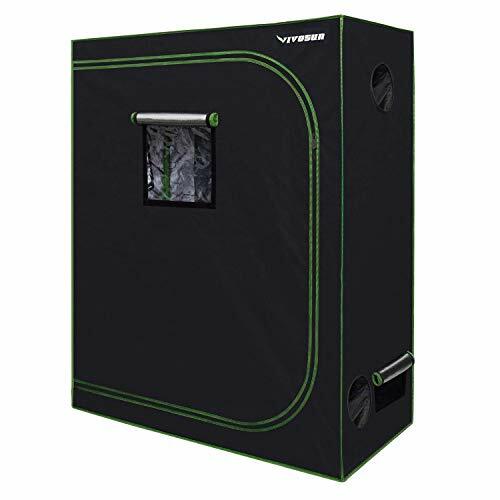 The Vivisun Mylar Hydroponic Grow Tent is an excellent way to get your toes wet in the world of growing weed. At one of the most affordable prices on our list, it’s a great beginner grow tent. 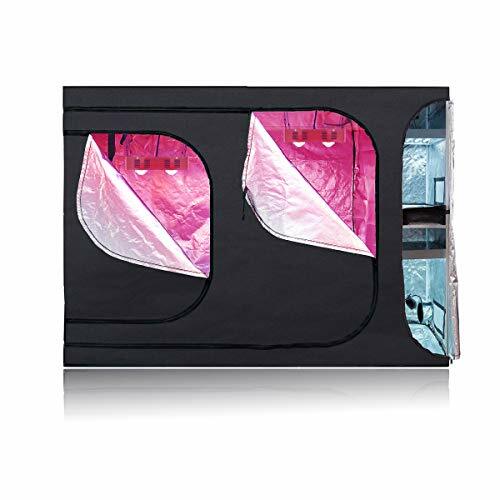 It also comes with a couple features you don’t see in a lot of grow tents—namely, the observation window. This is an excellent feature that allows you to peer into your grow tent and scan over your plants without disrupting the environment. It’s also made from a very thick canvas that’s both tear proof and double stitched. Its sturdy metal frame is easy to put together and can stand up to any fans and grow lights you want to hang from it. They claim to have the best zipper on the market. It uses an SBS zipper that’s a very high-quality but a tad cumbersome. You might need to oil the track, though, which can easily be done with some WD-40 or even running a cheap candle along it. The inside is a reflective mylar lining that is 95% efficient and the tool bag on the wall is a perfect spot for your pH meter, spray bottles or any other gardening tools you want quick access too. Can be used as a soil grow tent or hydroponic grow tent. And it comes with a removable mylar floor tray to make cleaning easier. Hence why you see them on this list so often. This is the model they made with the price conscious customer in mind. That being said, it still has all the features that you’d want from a Gorilla. It comes with a 100% steel interlocking frame and a huge easy to use zipper. Also, it comes loaded with tool pouches and 10" double cinching ducting ports. And, thanks to the large EZ View observation window, you can always keep an eye on you cannabis. 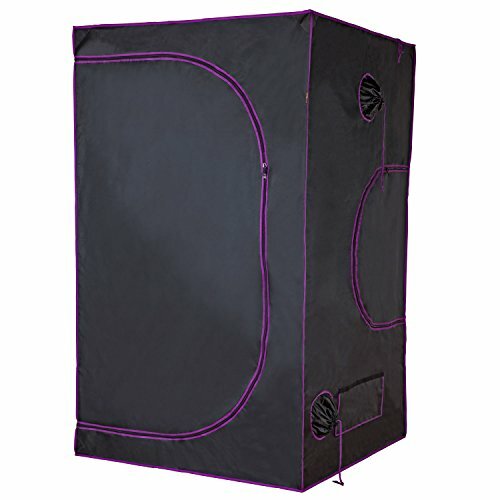 Another great feature of this grow tent is the 360° access you have thanks to the doorways and wrap around zippers. You’re not going to going to get a grow tent that’s 100% light proof. And this is not exception—don’t be surprised when light sneak up around the zipper seams and the stitching. Let’s face it, we're not all made of money. And, some of us need to grow our marijuana on a budget. That is where a good, albeit small, grow tent like the value box comes in. With it being only a couple of feet wide, you’re only going to be able to grow one plant in it, but even that one plant can yield a lot of bud if grown well. Another great use for a tent like this is a tent for your seedlings or clones. The only reason it’s price is so low is the size, because it’s not lacking in any of the features or in quality that you’d want from a grow tent. 99% highly reflective mylar lining and frame made from metal poles. Plus a nice viewing observation window for easy access and a water resistant mylar spill tray. And it comes with multiple exhaust and duct posts—making controlling the environment a breeze. Most grow tents are a single interior space. Perfect if you only grow one round of plants at a time, but not suitable if you want to produce a continuous harvest. As any cultivator knows, you can’t keep cannabis seedlings in the same room as the flowering plants. Nor can you combine vegetative and flowering. All these light requirements are not an issue with Topo, because it has three separate compartments. It has two small areas for the clones or vegetative plants, plus a big one for the final flowering stage. Manage all your plants, no matter what stage of development they are in with these three different enclosures. Each area is perfectly designed, with spaces for vents and electrical inputs exactly where you need them. Like any good tent, it also has three an easy-to-remove bottom tray for ease of cleaning. They have even upped the ante on the internal reflection. The silver interior is also a diamond style reflective material with 96 percent optimal reflection. A slick grow tent, that comes with a one year warranty. The iPower comes with a few key features which make growing weed inside that much easier. One of these helpful features is the removable floor tray. It makes clean up easy at the end of the season. It’s also got tough-exterior walls, made from tear resistant Mylar interior. One of the only drawbacks to the grow tent (compared to a grow closet) is the outside material which if roughly handly may get damaged. Tears or rips are not a concern with this tough external material. It’s got a sturdy metal frame, much stronger than any PVC or plastic structures you may have seen in the past. If you’ve ever built your own grow tent, you’ll know how tough it is to avoid light leaks. The iPower seams are double stitched, to make sure nothing escapes from the interior. As a big bonus, if you want to check on your plants quickly, you don’t need to go through the hassle of fully unzipping the door! The iPower grow tent has a quick-view window built into the side, making your life that much easier. Want more features that make growing easier? How about a handy internal pocket, suitable for storing all your pruning and trimming tools. Never misplace your tools again - keep everything exactly where you need it. It is a brand with excellent customer service as well, in case you have any troubles or questions after purchase. A Zazzy grow tent is an excellent value for your money. There are a couple of stand out features you’ll want to take note of. First and foremost, it’s completely light proof. The seams are carefully designed to keep your plants dark when they need to be and ensure no leaks at any point in the growing cycle. The seams are all double-stitched, with durable industrial strength zippers. The floor is a heavy-duty mylar construction, and removable for cleaning. If you spilled soil or accidentally splashed water you, quickly remove the mess with no fuss. The Zazzy frame is built from steel, and suitable for holding 110 lbs. This is the industry standard and should support any lighting system you choose for your indoor operation. It helpfully also comes in three different sizes: small, medium, and large. The large can hold up to 9 weed plants - more than enough for your needs! Unlike some of the other grow tents out there, the Zazzy structure is actually simple to put together. It comes with a set of clear instructions, which are almost impossible to mess up. Snap the frame together, zip the tent on top, and you are virtually ready to get growing! If you are struggling to put the material over the frame, remember to make sure the zippers are open before getting started. There are a ton of grow tents on the market, and in the end, any number of them will work for you. You just have to find the balance between price and features that will work for your cannabis grow op. Which do you think are the best grow tents? Or have any question? Please, let us know in the comments!